JARRETTSVILLE, Md. — One of the nation’s most conspicuous Church-State separation groups has written to a Maryland school district to request that it direct the removal of a plaque in an elementary school cafeteria that features a line from the Lord’s Prayer. The Wisconsin-based Freedom From Religion Foundation (FFRF) sent a letter on Wednesday to the superintendent of Harford County Public Schools after being contacted by a parent who reported that a sign reading “Give us this day our daily bread” is displayed in the Jarrettsville Elementary School cafeteria. The phrase is taken from Matthew 6:11, and is part of an exemplary prayer that Jesus taught his disciples to pray. “The district has an obligation to ensure that its schools are welcoming to all students, not just to those in the Christian majority,” it asserted. 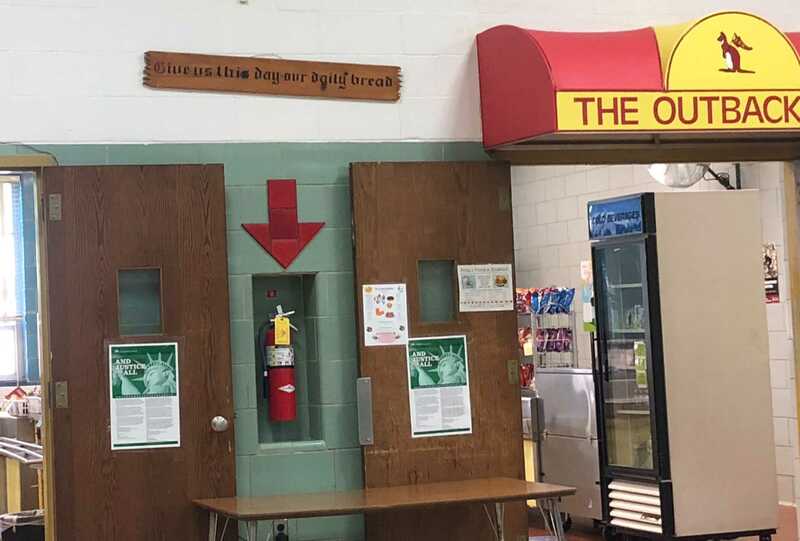 FFRF has requested an immediate removal of what it called a “unconstitutional religious plaque” from the school cafeteria. It is not yet known whether the district plans to respond. As previously reported, some judges believe that the Establishment Clause of the U.S. Constitution is being misconstrued as courts have been stuck in a rut of bad case law rather than viewing the text in light of the Christian roots of early American history. Last month, U.S. District Judge C. Ashley Royal wrote an extensive opinion in which he provided an outline of America’s beginnings, including the Puritans’ desire for a land where they could escape conformity to the Roman Catholic Church and worship God in the purity of the early Church. He explained the controversies that arose as other denominations—such as Baptists, Quakers and Congregationalists—came into the picture, and it soon became apparent through disagreement over doctrine that men needed to call for “religious toleration” as there couldn’t be one particular national church. That is, the government wasn’t going to establish the Baptist, or Puritan, or Congregational denomination as being the official church of the nation. It couldn’t choose one over the other. “Without letting the founders speak, without hearing their words and reading their papers, I think it is hard for us living in our post-modern, highly secular society to understand the religiosity of early Americans and the often tyrannical adversity that beat down religious minorities like the Baptists and the Quakers,” Royal wrote. “Religious toleration … was for everyone, and the federal government could not establish a national church. This protected religious freedom in the new country. But state governments could be involved in religion, and ‘separation’ only operated at the national level,” he explained.